Based on her popular blog, Not-So-SAHM , Rebecca Green takes readers on an inspiring journey using beautiful color photos that she took of her children doing activities she describes in the book. 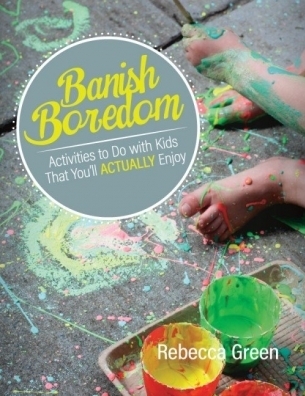 Taking a lighthearted approach to the serious business of parenting, Banish Boredom helps parents find activities that they enjoy, while their children learn and have fun. Green suggests ways for parents to maintain their own identities and pursue their own interests while raising children who are creative, confident, and independent thinkers. Although it offers valuable tips to parents, this book is not a parenting book. Rather, it’s a source of inspiration and new ideas for parents who are looking for fun and educational activities that they can do with their kids, but that are also fun and interesting for the parents themselves. The book emphasizes adapting activities to suit the particular interests of each child, while also taking into account the personality of the parent.